Edinburgh – a compact, hilly capital city that’s perfect for family fun! With 3 days to spare over the school Easter holidays we decided that a city break with our 8 and 5 year old would be a great way to spend some time as a family. Recent research from The Telegraph shows that the most affordable European destination for a spring break is Edinburgh. Our children have mentioned numerous times that they wanted to visit Scotland, so Edinburgh offered the perfect opportunity for an easy getaway. We could travel by train and the city is nice and compact, meaning we could spend more time enjoying attractions than travelling to and from them, which can be the case in a lot of larger cities. So, was a family city break in Edinburgh really the ‘most affordable’? I cannot say that we found it to be so, although accommodation was certainly very reasonably priced compared to centrally located family rooms in many other cities. There are also a lot of hotels within 5 or 10 minutes’ walk of the train station which certainly helps keep things simple. I have included entertainment prices in this review to assist you in your planning (correct as at March 2018). There are some lovely outside spaces which we were not able to enjoy, however families visiting in the summer months would most definitely increase the opportunity to enjoy the city and enjoy a bit more time that doesn’t cost pennies. You could easily spend £50 on a morning activity then another £50 on an afternoon activity. I would recommend you do your research and incorporate some free activities (there are some ideas in this review) into your schedule. Simple pleasures, like a slow meander down the Royal Mile, are lots of fun thanks to all the high-quality street entertainers who line the street. We stayed just off the Royal Mile (a Scottish mile apparently, so 1.4 miles!) with the Castle at one end and The Palace of Holyroodhouse at the other (and in between The Scottish Parliament, The Museum of Edinburgh, The Museum of Childhood, Camera Obscura and The World of Illusions). We were less than a 5 minute walk from Edinburgh Waverley Station too, so no messing about with taxis. We arrived at lunchtime on day 1 and left at dinnertime on day 3, so while time was limited, it was more than enough to pack lots in and leave before the children ran out of energy thanks to lots of walking and sensory stimulation! So, what did we get up to on our family city break in Edinburgh? Both our children said that Camera Obscura and World of Illusions was their favourite part of our Edinburgh trip. It has been the first thing they have mentioned to anyone who has asked them about their visit to Edinburgh. It is easy to understand why given that the entire attraction is fully interactive, and child are told as they enter that they can touch absolutely everything they see! I am not aware that the attraction has been recently refurbished, however all the exhibits and attractions are in perfect working order and show no signs of wear and tear. This is very unusual in our experience, especially when they are all being played with by children day in, day out! Your entrance ticket lasts all day, you hand is stamped so that you can come and go as you please. We were visiting on a school day outside of the Scottish school holidays – it was therefore not busy, even though it felt quite full. The attraction is housed in the original Camera Obscura 1853 building which is relatively small, with a spiral staircase (back packs required, no buggy access), and such buildings tend to feel full even when they are not really. I am sure the narrow spiral staircase can get very congested with people going up and down during busy periods. We were conscious that we needed to have our Camera Obscura visit during daylight, so as we walked past to enter the Castle (they are basically next door to each other) we pre-booked our camera obscura visit time and had our hand stamped. We then returned after our Castle visit. We went straight to the roof to enjoy fabulous views of the city, using the free binoculars and telescopes provided. We then entered Camera Obscura at our allotted time. To borrow the description provided by the attraction in their promotional leaflet: “From inside this mysterious Victorian rooftop chamber, you see live moving images of Edinburgh, projected onto a viewing table through a giant periscope”. Do you know what, that may sound quite staid, but the time we had in the chamber was great fun. Our presenter was fabulous and really engaged with the children with an enthusiasm which defied the fact that she loops this presentation every 15 minutes all day! Next we proceeded downwards to explore the remaining four floors. ‘Eye Spy Edinburgh’ is where you can access cameras on the roof and search out the unsuspecting public (or zoom in really close to all the roof tiles, as the man next to me was doing!). This was strangely addictive, and I am glad that we could spend some time playing with the cameras as I can imagine that when things are much busier, there is a pressure to move on quickly. The ‘Light Fantastic’ floor contains 3D and hologram pictures. Some of these were a tad scary for little ones (spiders, skulls etc) and our 5 year old was too short to see quite a few of the pictures. ‘Bewilder Word’ has a super mirror maze, which was perhaps smaller then we had hoped and I imagine would be no fun at all during busy periods as there would just be people bumping into each other all over the place. The rotating vortex tunnel was amazing, I am so glad that we got to go on it without anyone else (I say “we”, my travel sick prone husband took one look and turned straight around, stating that it would make him very poorly indeed!). Your mind plays crazy tricks on you and you find yourself clinging to a bridge to stop you falling off as it turns upside down (a bridge which is not in fact moving at all!). By far our favourite floor was ‘Magic Gallery’. Our science-mad daughter delighted in the plasma room and the electric shocks that she was able to pass onto her brother! The interactive and classic optical illusions were the highlight for us. Lots of opportunities to take some amazing photographs to delight both you and your friends. We had to queue for most of the photo opportunities so, at the risk of sounding like a stuck record, during busy periods I suspect queuing for long periods in this very hot room would be a horrible experience. Now to the negative – the ticket pricing. 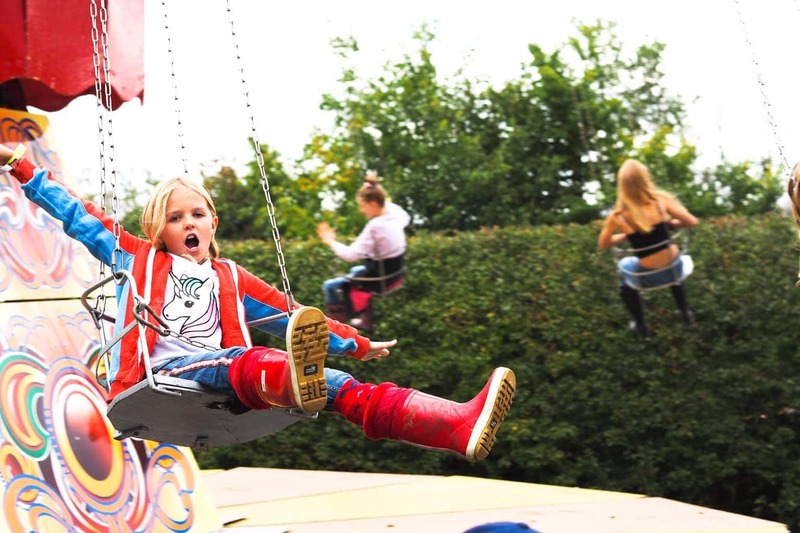 Adult tickets are £15.50, with child tickets at £11.50 (5-15 years, under 5’s free). No family tickets are available, which is unusual at such an obvious family attraction. So, a typical family of 4 would be paying £54 and a family of 5 would be £65.50! We quite literally looked at, touched and played with everything at the attraction, including the 15 minute slot for the visit to the camera obscura itself. We were done within 1.5 hours. Admittedly, the attraction was not busy, so we were able to get around quickly without queuing, but I am not sure that saying you spent that sum and spent 2.5 hours there would be of much comfort if an hour of that time was spent in queues! The Castle sits on top of an extinct volcano and looks down imposingly and impressively over all of Edinburgh. 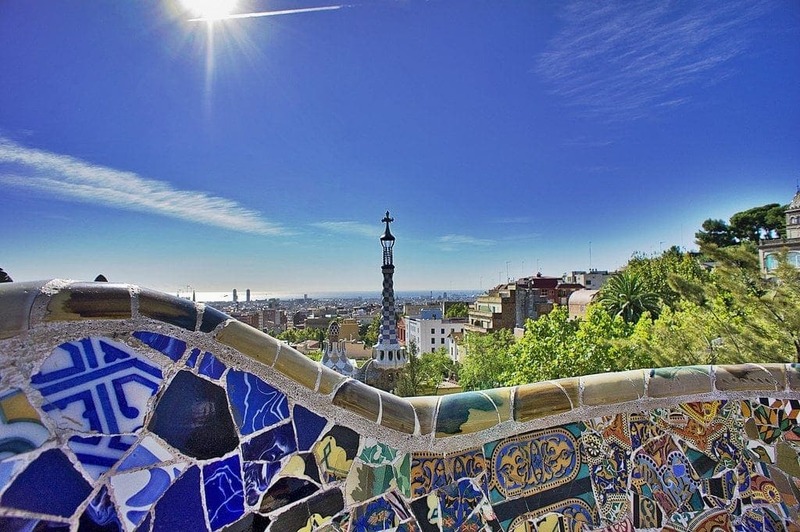 It is on the top of most people’s bucket list when visiting the city (we did in fact visit on our previous child free trip), but is it family friendly? Tickets to Edinburgh Castle can be purchased in advance, which are a few pounds cheaper at £18.50/£17 for an Adult ticket and £11.50/£10.20 for a Child (5-15) ticket. The admission price includes a complimentary tour (30 minutes), however the audio tour is an additional cost to the admission price – £3.50 per adult and £1.50 per child. Notably, this was the only attraction we visited where the audio guides were not included in the admission price. This additional cost was, in my opinion, excessive and unwarranted. A family of four could be looking at a £70 outlay to visit the Castle; that is a considered a big spend for most. It was windy and drizzling when we visited Edinburgh Castle, so we decided not to take advantage of the complimentary tour as the group seemed to be standing outside for quite a while. My husband and I had done the audio tour before and we did not think our 5 year old son would get much out if it, but our 8 year old daughter was very excited to have the audio device hanging around her neck and a set of headphones. There are numbered plaques around the Castle – you simply punch the relevant number into your handset. She really enjoyed the content and was full of facts and stories as we walked around. The children also collected an activity sheet from the audio tour desk and it was a sheet that they really enjoyed completing, as the questions were varied and fun. The first thing to say is that describing this attraction as a castle feels misleading. It is a fort, or a barracks, so if you expect a traditional castle you may be disappointed. Within the Castle walls there is a collection of buildings varying greatly in age. There is still an active barracks at the Castle and as a result there are numerous buildings that you can not enter. Military history features heavily at Edinburgh Castle. There are two regimental museums (The Royal Scots and The Royal Scots Dragoon Guards), the Scottish National War Memorial, a Prisoners of War exhibition and the National War Museum. My husband and I had visited all these previously and, not being that in to military history, had no desire to visit them again. We were also conscious that a 5 and 8 year old were not necessarily the right audience for such things. 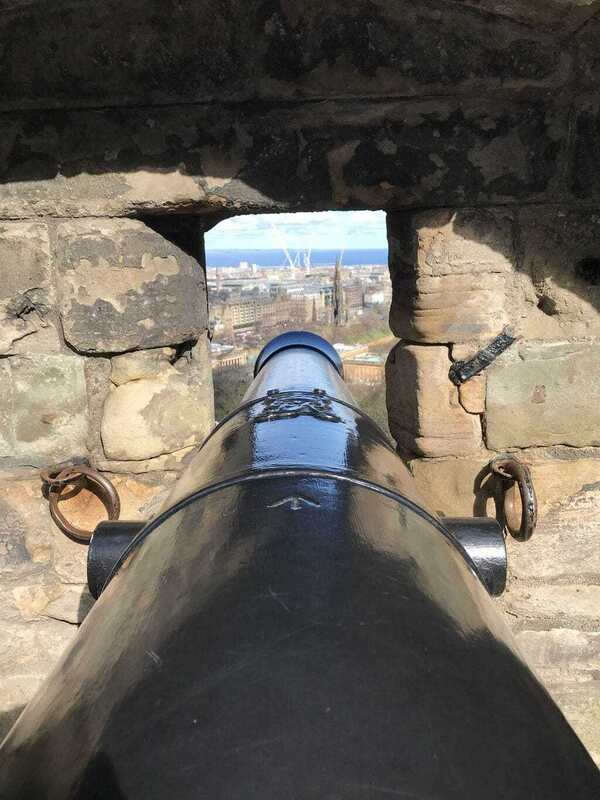 We started by walking around the battlements where we enjoyed the amazing views and spent much time sitting on and learning about cannons, including Mons Meg and the famous One O’Clock Gun. The rain then forced us inside. Unfortunately, The Royal Palace (apartments) were closed whilst a new exhibition was being installed and conservation work carried out. Instead we headed to see the Scottish crown jewels; the crown, sceptre and sword of state are the older crown jewels in the British Isles. Housed in a small, darkened room (well, a vault really, judging by the doors), the three items are displayed in a central display case where you can get a relatively close view. The room was understandably busy, which was not assisted by the one-way system which forced you to around the room one and half times (I guess no-one was thinking about the general public’s viewing pleasure when the Palace was being built!). History was then brought to life with ‘live’ talks. On the day we visited this focused on Tudor fashion in The Great Hall. Numerous beautiful costumes on display, as well as two guides dressed in appropriate dress who gave an informative talk followed by time for photographs and individual questions. The Great Hall itself, with its spectacular ceiling and stained glass windows, also houses an impressively displayed selection of weapons, which our son decided was more fun than learning about long-past fashion styles. His interest was sparked in the next building, Prisons of War, where the prison recreation told the story of some of the prisoners held at the Castle over the years. The story of the 5 year old drummer boy, captured at the Battle of Trafalgar in 1805, was impossible for his 5 year old head to compute, so we moved on. We ended our trip in the café, I’m glad we were drinking rather than eating as the food prices were on the eye watering side. The views however are magnificent. The cafe has taken full advantage of its vantage point over the city by installing floor to ceiling windows which result in a wall of glass. Including the café visit we were at the Castle for 2 hours. I confess that I looked on TripAdvisor before writing my review of the Castle. You see, I know that all my Scottish friends consider it to be mighty and magnificent, and I found myself disappointed. I wondered if I was alone. Certainly, if those reviews are a guide, foreign visitors seem to consider it to be a great place to visit. I share the awe of its position over the city, the impenetrable looking walls melting into the volcano, it really is an impressive site. Being within the walls, the views across the city and surrounding hills and sea are awesome. I feel that the view of the Castle and the view from the Castle may be what creates the positive lasting impression. The barracks within are undoubtedly interesting, but not unmissable if you have time or budget restraints. We are fans of walking tours and have done at least one on each city break we’ve done as a couple. In fact, we’ve done an excellent tour in Edinburgh. However, we decided that with the children it would be more beneficial (and fun) to do a bus tour, sitting on the roofless top deck on course! Edinburgh Bus Tours offer various options. I had heard good things about the ‘City Sightseeing Edinburgh’ tour, not least because they had an option for a children’s “Horrible Histories” audio tour. However, we opted the ‘Majestic’ tour as included within the hop on-hop off stops were the Royal Botanic Gardens, Britannia and The Palace of Holyroodhouse, all on our list of places we would like to visit. The tour therefore seemed like a good way to help us move around the city and learn a bit more about its history on the way around. It is worth checking out the various route options as there are options to purchase all-inclusive tour tickets, which include entry tickets (at reduced prices) to certain attractions. The buses leave from Waverly Bridge and were clean and comfortable. You were supplied with a pair of earbuds as you entered the bus which plugged into a small display panel on each seat. The audio tour itself was interesting. Unfortunately, the children could not enjoy it because the earbuds didn’t go anywhere near to fitting into their ears. It’s a shame that headphones were not provided for children or that you were not advised to bring your own (I wonder if the children’s “Horrible Histories” audio tour was better served?). At £7.50 for a child’s ticket, it makes it an expensive tour when they can’t hear anything! 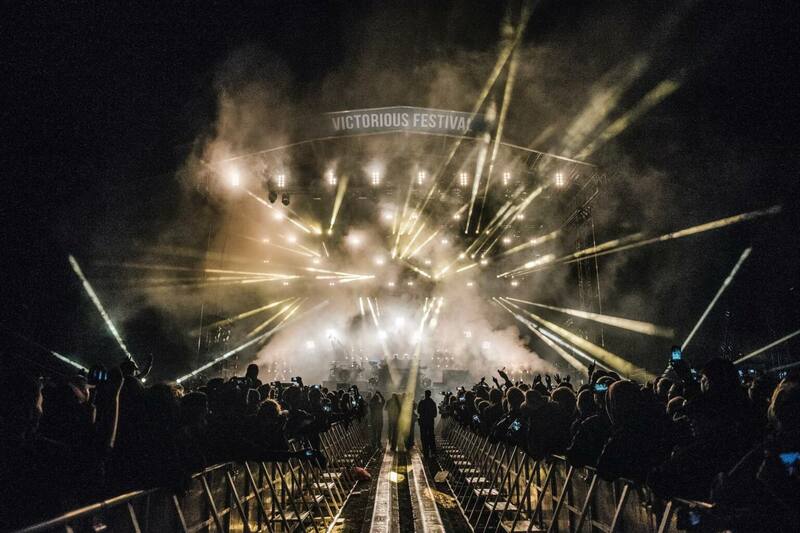 (Adult tickets are £15 or a family ticket is £36 and covers up to 2 adults and 3 children, making it great value). The small display panel did offer a basic computer game to play, which luckily kept our 5 year old entertained on and off. Our 8 year old utilised the small colouring book with crayons that we were given when we purchased our tickets and relied on us to relay any interesting stories from the audio tour. Britannia is berthed at Leith Docks, adjoining a shopping centre (The Ocean Terminal Shopping Centre). It is easily reached by car (20 minutes from Edinburgh city centre, with free parking) or by bus (numerous public services and various tour bus companies operate from the city centre). You enter Britannia via the visitor centre on the second floor of the shopping centre itself. It all feels a bit odd! You purchase your ‘boarding pass’ from Britannia’s space within the centre. 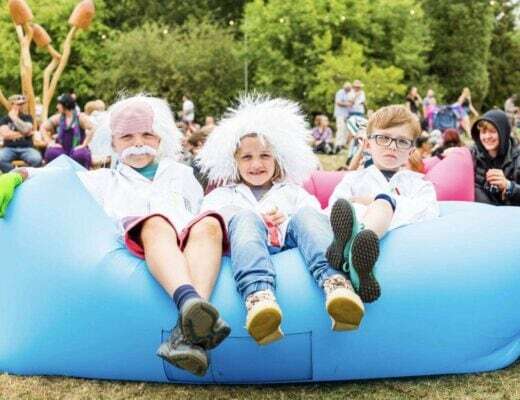 Adult tickets are £16, Child tickets are £8.50 (5-17, under 5’s free), with a Family (2 adults, 3 children) ticket priced at £45 – pay once and you can visit free for a year! You then move on to collect your audio tour. These are in the shape of a keypad on a large wand, for want of a better description. The tour followed the numbered plaques format where you punch the relevant number into your handset. The Britannia tour comes in numerous languages and, most importantly for us, there is a separate children’s audio tour. You then progress to a tower containing a staircase and lifts, which sits alongside Britannia and offers access to each of the Britannia’s floors. You do not use internal staircases, making Britannia fully accessible for single pushchairs and wheelchairs. There are also plenty of places to sit as you move around. The tour starts in the wheelhouse on the top deck. You’ll be distracted for a short time by all the interesting boats docked in the harbour! As you tour the decks you will hear stories of Britannia’s past and the special role she has played in the history of the Empire and in the hearts of the Royal family. Seeing a Rolls Royce parked in the glass garage on deck, exploring the flags, and playing with the signal lamp (dot dot dot, dash dash dash, dot dot dot…..that’s my limited knowledge utilised! ), keeps the children’s interest. Once inside Britannia, there is a rather unique feeling that you are in someone’s home. In reality, you are; Britannia was a floating Royal residence from 1953 until 1997 when she was decommissioned. The Queen and Prince Philp, we are told, either chose or purchased the furniture and soft furnishings themselves. I suspect much of it in fact dates back to the 1950’s as it certainly felt in many rooms as though you were visiting elderly grandparents! The first room you enter is the sun room. Our son was very excited to see that the cabinet full of board games contained several that we had at home. I was quite impressed with the well-stocked alcohol cabinet. You then move on to see the Queen’s bedroom (very floral and simple), Prince Philip’s bedroom (the bed looked shorter than his 6ft and only twice his width, it was like a child’s bed!) and one of the guest rooms (containing the only double bed, brought on board for the honeymoon of Prince Charles and Princess Diana). Clearly there are lots of rooms not on display to the public given that the tour tells us on average 5 tonnes of luggage was taken on a journey and the Queen’s bedroom doesn’t even contain a wardrobe! If we ever do the tour again, I will be asking for the children’s audio tour. It seemed to be full of funny anecdotes and interesting facts. Don’t get me wrong, the adult audio tour is informative, personal and very interesting. However, the children were telling us fantastic stories from their guide. They really enjoyed following the numbered plaques and undoubtedly had information and stories very well pitched at their level of understanding and interest. As an example, in the grand banqueting room, the adult tour gave the history of some of the objects on display (all gifts given to the Queen during trips on Britannia). 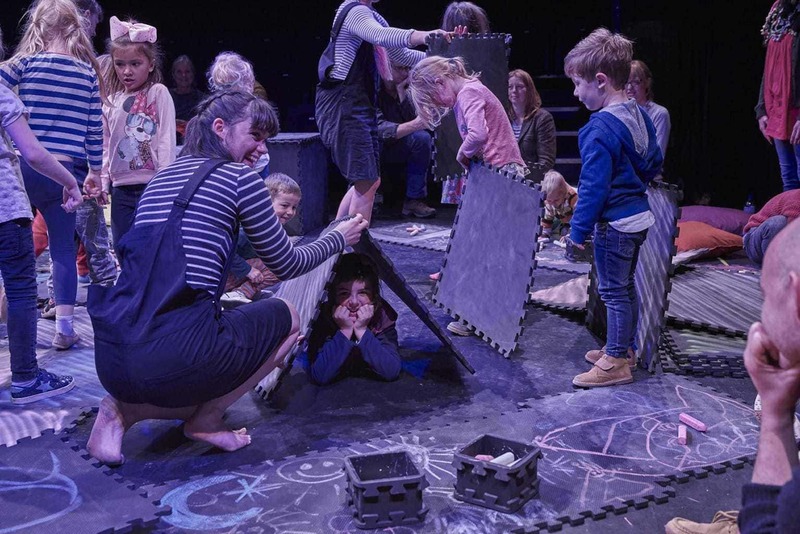 The children’s tour told of a tribe who had presented a baby crocodile in a biscuit tin, which had to be kept in the bath of the Queen’s Secretary until it could be offloaded to a suitable location! Following on from the formal banqueting room is the formal sitting room. The Queen had wanted an open coal fire(!) but this had not been possible. A baby grand piano is bolted in the corner of the room and you are told stories of its famous life, including being played by Noel Coward. 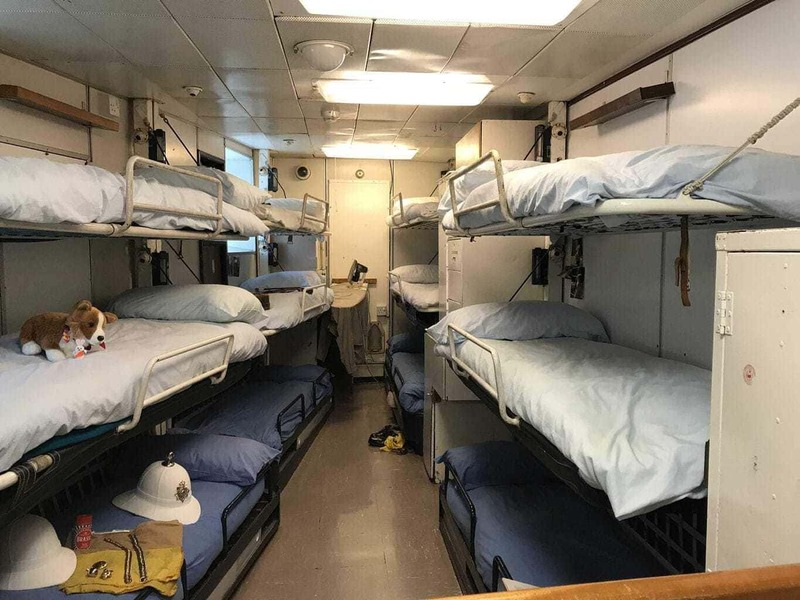 The tour then continues into the dining and sleeping quarters of the most senior crew (even the Captain, an Admiral no less, has the smallest of living quarters – the children could not believe that grownups could sleep in such small beds). The more junior crew lived effectively in dormitories. (I would mention the size of the beds, but I think that is turning into a theme of this review, you get the idea, all beds onboard are unfeasibly small!). For them Britannia was home for months at a time. The very limited wardrobe space is also a mystery to me as the audio tour advises that each member of the military band carried 26 different uniforms. I need those tardis wardrobes! The final stop on the tour of Britannia, after the post office, NAAFI (now selling yummy fudge made on board) and the large laundry, were the engine rooms, viewed from above and behind a glass screen. We could have lunched on board, in the Royal Deck Tea Room. On a weekend break without the children, I had lunch here with my husband. It was lovely but it was not something we thought would suit us on this visit with the children. So instead we headed into the shopping centre and took advantage of the nice weather by purchasing an M&S picnic style lunch to enjoy by the water. There was a selection of eateries in the food court of the shopping centre for those wanting something more substantial. It really is a very enjoyable and informative couple of hours. It is something quite different too and the children’s audio tour really brought the place to life for the children. It was our highlight of the weekend. I’m a bit of a Tudor history buff, so the opportunity to visit The Queen’s official residence in Scotland, and learn about it links to Mary, Queen of Scots, was one I relished. As we were in Edinburgh as a family, everyone else had to come along too! The admission price includes an audio tour and free return visits for the following 12 months – with ticket prices at £14 per adult, £8.10 per child (5-17), and a family ticket costs £36 (2 adults and up to 3 children). 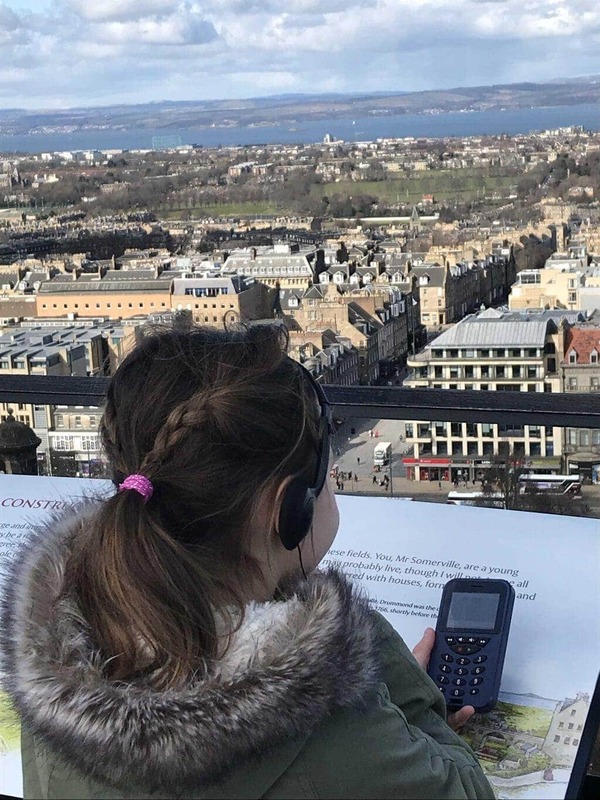 The audio tour is available in numerous languages and, as has become a welcome standard in Edinburgh, a children’s version of the tour was available. They followed the usual numbered plaque format with mobile phone style handsets. 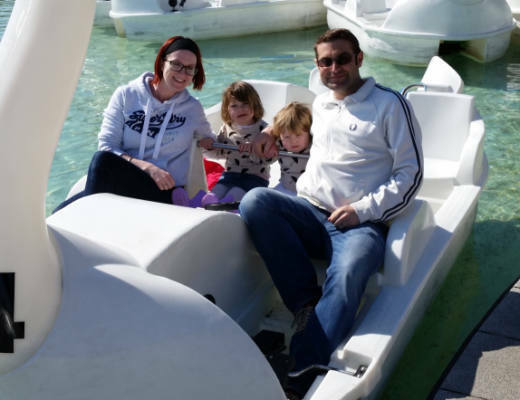 There are some steep steps on the tour and you are not allowed to take a pushchair around with you, although backpacks and hip seats are available to borrow. To quote the website, “The tour guides you through your visit to the Palace, including the Royal and Historic Apartments. The commentary introduces the history of Holyroodhouse and explains the role of the Palace as an official residence of The Queen. Hear about the Palace’s former residents, including Mary, Queen of Scots and Bonnie Prince Charlie.” The website further advises that the audio tour lasts about an hour. In fact, it lasted exactly an hour. You are firstly welcomed by the voice of HRH Prince Charles as you stand in the courtyard, with spectacular views of Salisbury Crags and Arthur’s seat. You are also advised that no photography is permitted within the Palace. As you proceed into the Palace it becomes clear that it would be very difficult to take photographs in any event as all the rooms are so dim due to the black window coverings. In the older rooms (as in those which are clearly a museum rather than used by the Queen during her visits) this could almost be described as atmospheric; in the others this simply made things a bit dingy. The final stop on the tour is the adjoining Holyrood Abbey, which is quite magnificent on the inside (ruins). The photographs on the website suggest that the Abbey is spectacular on the outside and that the adjoining gardens are also quite lovely. However, we visited in March and they were closed, so we did not have the opportunity to enjoy either. I suspect that this would have extended our visit, which in total lasted 1.5 hours after we spent half an hour in the family room, enjoying the colouring in, dressing up and Victorian games. There is an activity trail for children, and unusually for such activities there is a degree of skill to it. Our 8 year old therefore really enjoyed it, however it was not something our 5 year old could participate in. The throne room was her favourite, whilst our son was more interested in the great gallery (mainly due to the interactive screens allowing for a more in depth look of some of the collection held at the Palace). As previously mentioned, I was looking forward to Mary, Queen of Scots’ chambers. The audio guide was informative, and I enjoyed learning more about her 6 years at the Palace. As a whole we enjoyed the audio tour and it offered a good balance between historic information and modern day relevance. However, I am afraid to say that the children’s audio tour, having been such a hit at Britannia and the Castle, was a bit of a flop for us. Now, to be fair, it was guided at age 7 to 11, so we were not surprised to find that our 5 year old could simply not engage with it and quickly stopped even bothering to punch the appropriate numbers into his handset. Our 8 year old, who very much enjoys history, stuck with it though. Although she did confess at the end that she had not really enjoyed the tour and that it had disappointed her. I therefore suspect that the audio tour is better suited to older children, but you should note that I have only listened to short excerpts of it. There are various interactive activities available on the website; it is a shame that these weren’t available on screens throughout the Palace as this would have involved children more in the history. All things considered, I would suggest that visiting in summer when you could enjoy the outdoor space would really add to your enjoyment of the Palace. Also, for children under 7 may struggle to engage, which of course makes for a more stressful visit for parents as it’s difficult to enjoy an attraction whilst trying to entertain a bored child. Recently refurbished, this free museum is centrally located and a nice way to spend half an hour. I’ll be honest, I hadn’t anticipated how small The Museum of Childhood would be and had intended to spend quite some time there. In actuality we spent an hour, solely because there were only a handful of children there which meant that our two were able to spend as much time as they wanted playing tiddlywinks and noughts and crosses. My husband and I were certainly amused to see toys from our childhood now featuring in a museum; although the ZX Spectrum was always destined to go down in history! Just a few miles from the centre of Edinburgh, the zoo is easy to reach by public transport (a family of 4 will cost you £5 each way on any number of buses from Waverly Bridge) or by car (£4 parking charge, not refundable against the purchase of entrance ticket or anything else at the zoo, which is a shame). You’ll pay between £50 and £60 for a family of four, depending on whether you purchase early bird tickets online or not and whether you choose to remove the voluntary donation which is automatically added to each ticket price (there seems to be a trend of adding ‘donations’ at the moment and I am not a fan of the practice). If you book online you can also book a time slot to view the pandas, although you can do this on the day of your visit too (although it is not always necessary, we visited outside Scottish school holidays on a drizzly day and there was not even a queue to see them). Did you see how I just casually slipped in pandas to this review? For the two giant pandas were the main attraction for us and for a lot of the zoo’s visitors, being the only ones in the UK! Edinburgh Zoo is on a hill. The topography is very steep, uneven, slippery in places and full of steps. Certainly, sturdy shoes are required; flip flops would be a disaster waiting to happen! A pushchair will require a strong pair of arms to push. 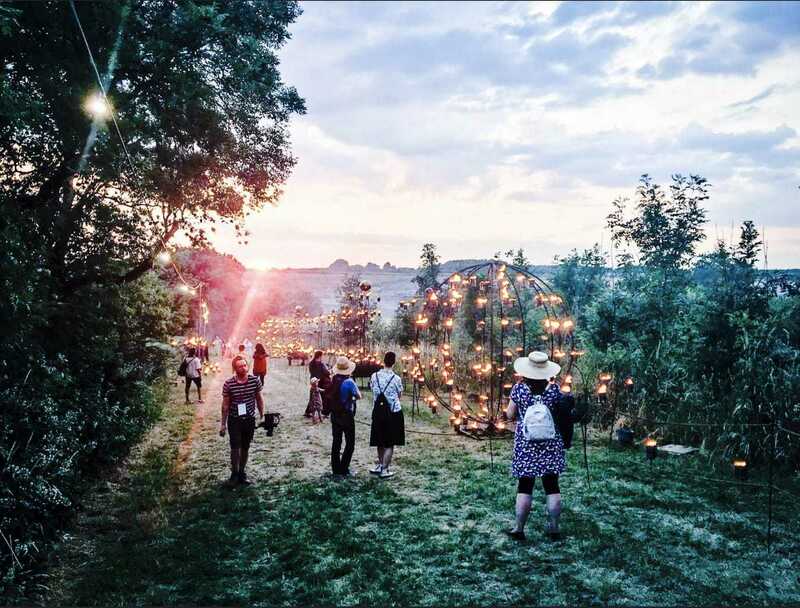 Walking to the highest point first thing and then working your way down the hill throughout the day should assist in preventing complaints about tired legs from the younger members of your group. I understand that in the summer a small road train operates to take visitors to the top so that they can then walk downwards to explore the enclosures. It is not a large zoo and is limited by the geography of the site. Whilst it does not have many of the ‘big’ animals, there are two lions, a tiger and a rhino. There are a lot of monkeys though. The ‘squirrel and capuchin monkey living links’ is particular fun for little ones and adults alike, watching these fun little things play together and jump around their indoor/outdoor enclosures. There are three short but fun walk through areas where there are no fences to stop the animals roaming with guests. The first you arrive at is a monkey area, where children especially delight in having monkeys jumping over their heads and running past them on the path; there is also a pelican area and a wallaby walk through (where we got up close and personal with some wallabies having a ‘special cuddle’!). I especially enjoyed the tranquillity of the koala enclosure. It was like being in a library, you can hear a pin drop; no one wants to alarm these beautiful creatures. If you haven’t seen them before, they are surprisingly small. It is therefore very much luck that decides if you get a good view of the koalas going about their everyday business, slowly! 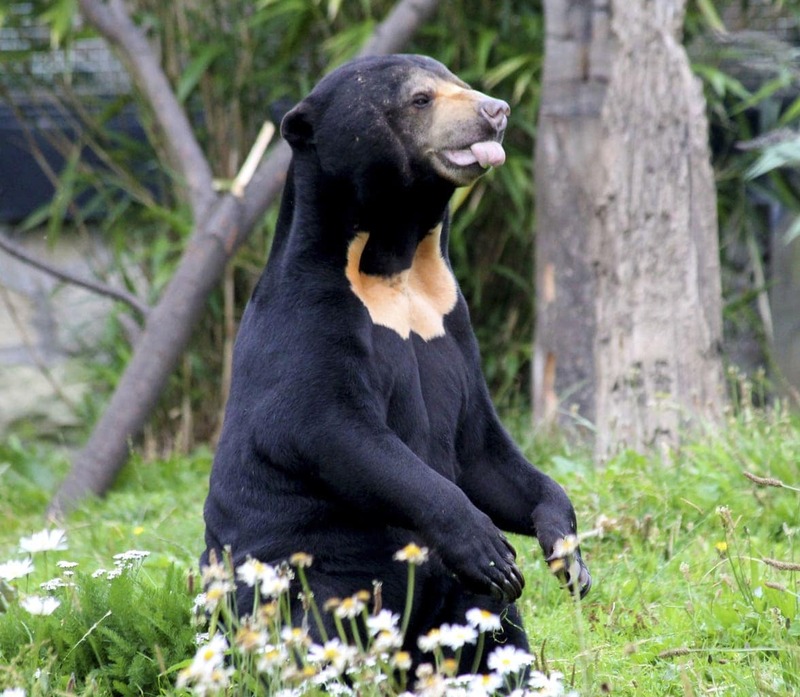 The sun bears had just woken up when we arrived at their enclosure, so we got to see lots of cute yawning and stretching. Like most of the enclosures at the zoo, the animals have an inside and outside area, and the public have access to both. As well as the indoor element, many of the larger enclosures also have a viewing shelter. Edinburgh Zoo is well designed to make the bad weather as minimal a discomfort to visitors as possible. 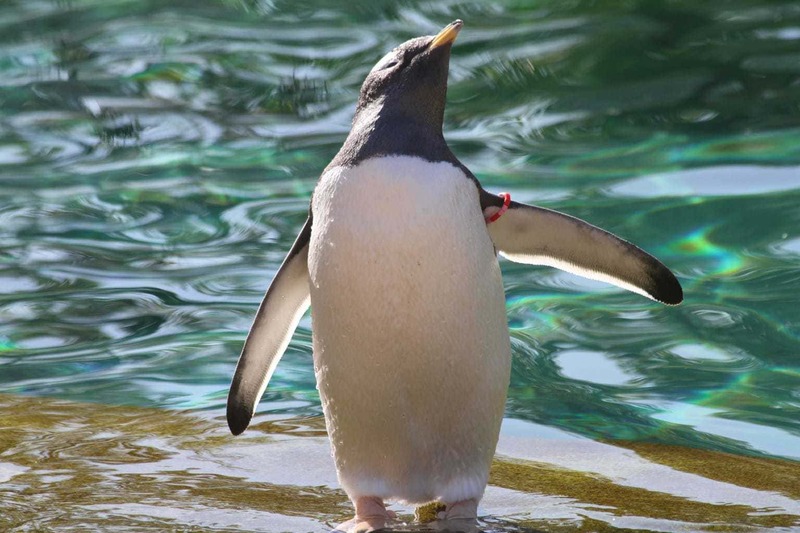 At Penguin Rock, Europe’s largest outdoor penguin pool, you can lose track of time. All the penguins seem to have their own personality and it’s so entertaining to watch them interacting. Children rarely leave willingly and have to be tempted away (luckily there are ice-cream kiosks nearby!). There are daily events (which you should take a note of when you arrive to ensure that you don’t miss out on anything! ), the penguin parade is one of the most popular. The penguins that choose to leave Penguin Rock and are allowed to walk a set route amongst the crowd. On to the main attraction, the giant pandas! There are two pandas, in separate enclosures. To avoid disappointment, you should be aware that there is no guarantee that the enclosures will be open, or that the pandas will come out of their living accommodation into their enclosure. If they do, there is no way to ensure that they’ll do anything at all or indeed, that they won’t hide in the undergrowth so that they cannot be seen from the viewing gallery! If you are lucky enough to get a good view though, it is something quite special. The enclosures were closed when we arrived, and we were told to keep checking back to see when they were open (easier said than done given the hills!). They were however open in afternoon although only one panda had chosen to come outside into the damp weather. On our first visit we could merely see a black and white lump between trees. On our second visit of the day we were lucky enough to see the panda sit up and roll over into a new position. It only lasted a matter of seconds, but it was delightful. The practical bits: There are three main eateries offering snacks to sit down and hot meals, as well as various kiosks open at peak periods. The zoo also has many picnic benches dotted around (but no undercover picnic area) as well as various grassed areas. There are lockers available at the entrance, costing £4 or £2 to rent depending on the size you require. These would be particularly useful if you didn’t want to haul a picnic around with you (and have a member of your party who won’t moan about having to walk up and down the hill to get the bag!). The zoo has plenty of toilets, all with baby changing facilities (although only in the ladies toilets in the smaller toilet blocks that do not have a disabled loo). Finally, there are three play areas in the zoo, with one catering especially for toddlers. 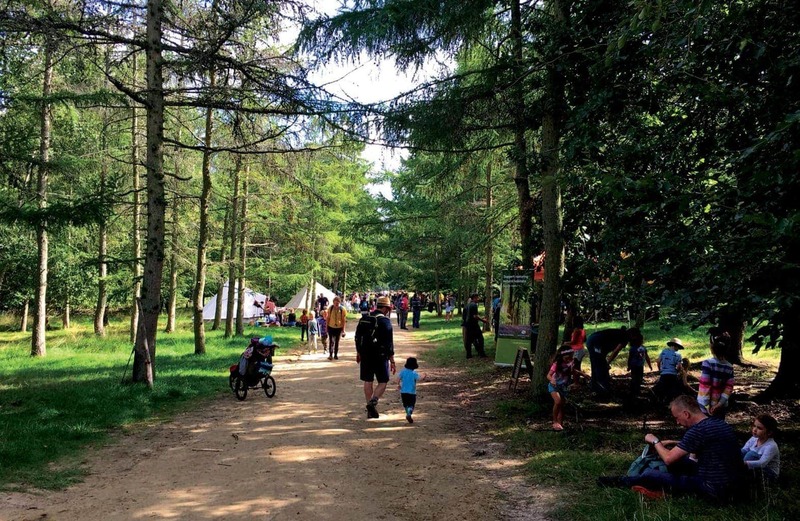 As all parents will know, park stops can extend a day out by an hour or more! On a quieter day, such as the day we visited, you can experience the whole zoo in four hours (including lunch). Throw in some queuing to see the animals and some time at the play parks and you could send an enjoyable day here as a family. 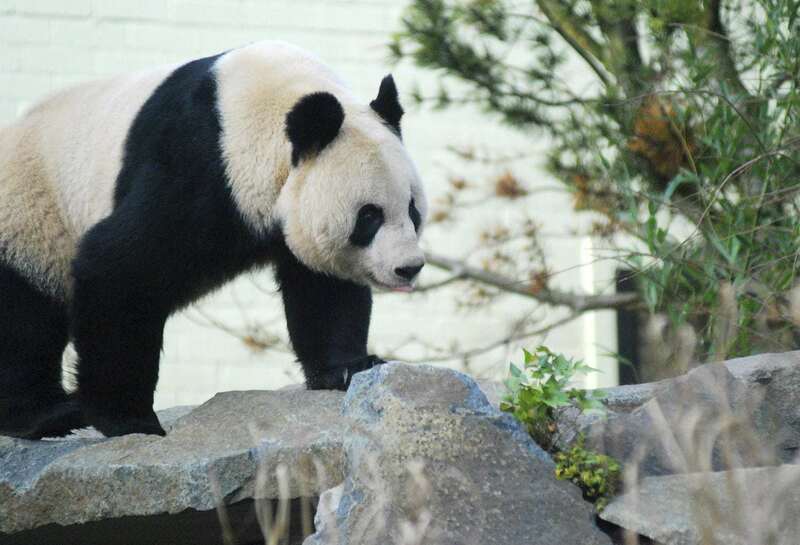 If you’re planning a visit to Edinburgh Zoo why not check out our A-Z of Edinburgh Zoo. Edinburgh-based friends have advised us that Dynamic Earth is worth a visit, as are the Botanical Gardens (in the summer). The National Museum of Scotland also comes very highly recommended as a full day’s entertainment with lots of interactive displays for children (truth be told I wish we had gone there rather than spending the afternoon at Holyroodhouse and The Museum of Childhood, as I think it would have suited our children better). 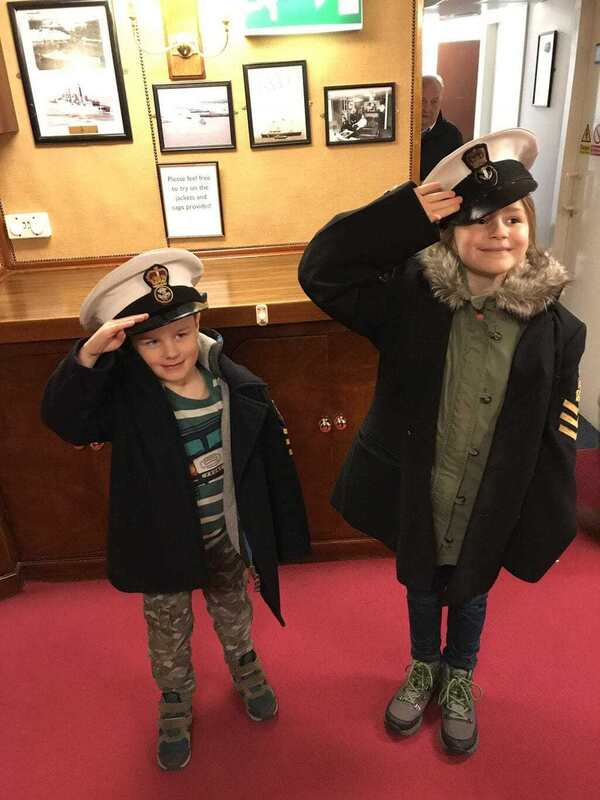 The Palace is directly opposite the Scottish Parliament, which offers free tours on certain days, we however felt that our children were too young to understand or benefit. Finally, if you’re feeling fit, the walk up to Arthur’s seat (one hour each way for a fit adult; add on the appropriate time for any additional little legs in your family) is meant to be well worth it. 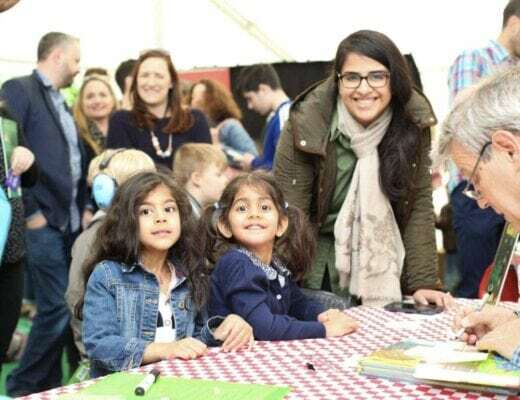 As part of her visit to Edinburgh, Kelly and her family were kindly provided with entry tickets by Visit Scotland, The Royal Yacht Britannia Trust, RZSS Edinburgh Zoo, Historical Environment Scotland, The Royal Collection Trust, Lothian Buses and Visitors Centre Limited. However, the views given are all the writer’s own. These all look like beautiful spots to visit. Unfortunately I haven’t managed to travel to Edinburgh yet but it’s definitely on my list. Oh, how I love Edinburgh! I had a great time there and even the more touristy things were such fun. I can only imagine kids loving it too! You are so right! Although being spoiled with so many magnificent castles is a nice problem to have! Your description of everything you did with your family in Edinburgh makes me want to go so badly! Now I have another place to add to my bucket list! I’ve not been to Edinburgh for years and not at all since having the girls. There’s so much inspiration here! We are visiting Scotland soon too. such a useful post. I remember really enjoying Camera Obscura too, even though I think that was over 10 years ago that I went. I’d love to go back to see if I still enjoy it now!